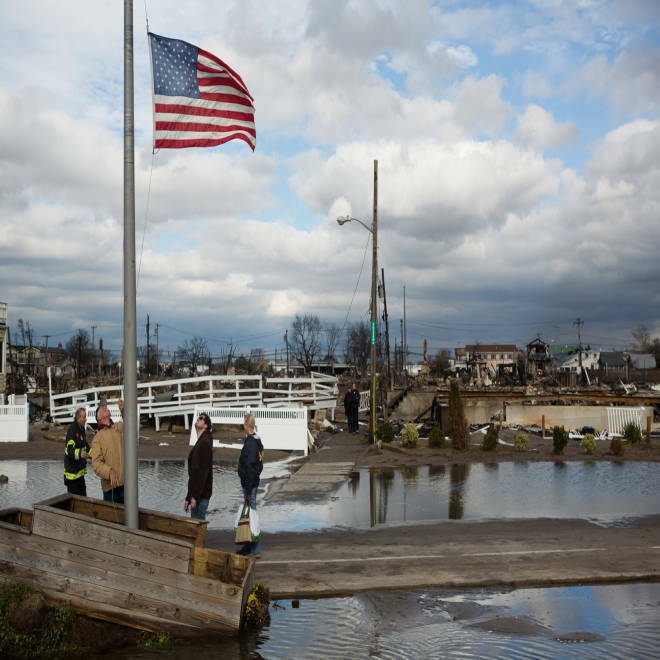 Bob Reilly, left, and his son, Bobby, raise a flag in front of the burned-out Wedge section of Breezy Point, N.Y. on Wednesday. BREEZY POINT, N.Y. -- A wife’s handmade pottery jars, a son’s metal fire truck, a father’s golf clubs. Those were just a few of the items recovered Wednesday as hundreds of residents of this tight-knit seaside community returned to reconnect with friends and pick over the remains of flooded and burned homes left behind by Hurricane Sandy. The storm delivered two punishing blows to the community founded more than a century ago by Irish immigrants. First it sent floodwaters roaring through its streets and into its homes, then sparked an inferno that claimed more than 100 houses nestled side-by-side on tiny lanes of sand. Despite its idyllic setting, tucked between the Atlantic Ocean and a bay at the southwest corner of Long Island, Breezy Point has not escaped the world’s cares: More than 30 of its residents died in the 9/11 attacks, many of them police or firefighters. A plane also crashed further up the island in November 2001, killing everyone onboard plus a few bystanders on the ground. The supportive nature of the community was on full display Wednesday. There were some laughs to lighten the somber mood, including a few jokes about upscaling the Sugar Bowl, a popular watering hole on the beach that was flattened in the storm. One woman rejoiced at finding her margarita mixer. Neighbors gave and received comforting hugs. Roland Wertz, after visiting his burned out home in Breezy Point, N.Y. on Wednesday. Roland Wertz, 69, collected some pottery jars made by Heidi, his wife of 50 years, from the ashes of his home in an area known as The Wedge. Breezy Point was under a mandatory evacuation order, and most residents left on Sunday believing they would return home in a few days. “We just figured, miracles of miracles, maybe (it) would be sidestepped” by the storm, he said, tears streaming down his face as he cradled the jars in his hands. Wertz, who was joined by his son and two grandsons in a search for missing keepsakes, said he and his wife felt instantly welcomed when they moved to Breezy Point nine years ago. His son, Ira Nachamie, 54, added that Breezy Point was where the extended family gathered for the holidays: “This is where we come to be a family,” he said. But Wertz said he didn’t think he and his wife would be coming back, and that many other neighbors also may not have the will or resources to rebuild. Kieran Burke surveys the burned-out remains of his Breezy Point, N.Y., home. Kieran Burke, 40, was less than a mile from his childhood home that he now shares with his wife and 2-year-old son, when he saw flames Monday night. As a firefighter, and recently minted fire marshal for an engine company in Brooklyn, he felt he had to do something. He rushed to the neighborhood, at first not realizing his own home was threatened. As the night wore on, the threat became reality: His house was in the last row of those on the southern edge to go up in flames. A chimney is now all that remains of Burke’s home. He sifted through the charred remains, finding a few things to salvage: A memento from a trip to the Bahamas with his wife, some favorite beer from Hawaii and his son’s metal fire truck. Gone were his fireman gear and his old fire department magazines, though firefighters found a steel beam he had saved from his time at Ground Zero. Burke, who recalled playing kick the can with friends as a kid on the “sand lanes,” as the walkways are called, said he is not harboring any thoughts of moving. 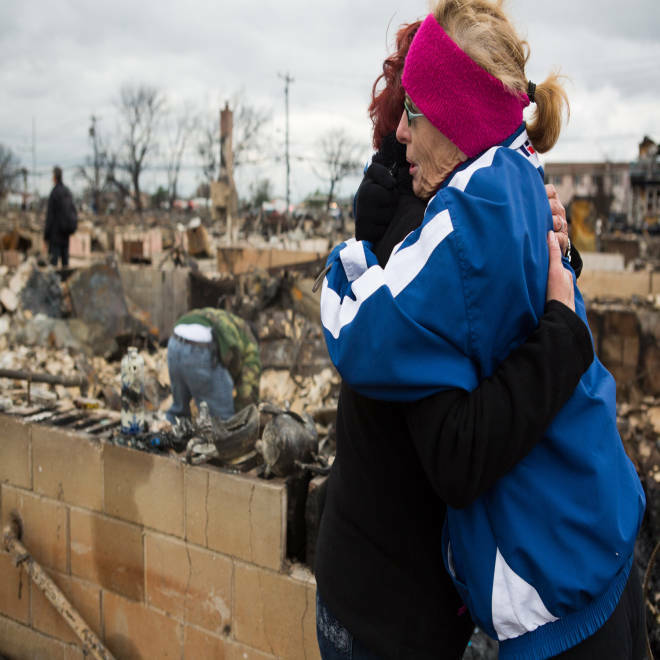 Friends Laurie Klein, right, and Lucille Dwyer embrace next to the burned-out remains of Dwyer's Breezy Point, N.Y. home Klein's home, several blocks away, was outside the fire zone but suffered severe flooding. Lucille Dwyer, 64, said she has alternated between crying, laughing and being angry over the fire that took her home of 23 years. She joked about losing her three Coach designer bags and her huge black-and-white bathroom, but she said she also is heartbroken. Dwyer said she hadn’t wanted to evacuate but her husband, Gerald, has cancer and needed to be close to medical care. They hadn’t imagined they could lose their home, so they didn’t take precious items, such as her mother’s 70-year-old dining service, with them. Dwyer said she and her husband would look for temporary housing, since she believes it will be at least 18 months before they can return. 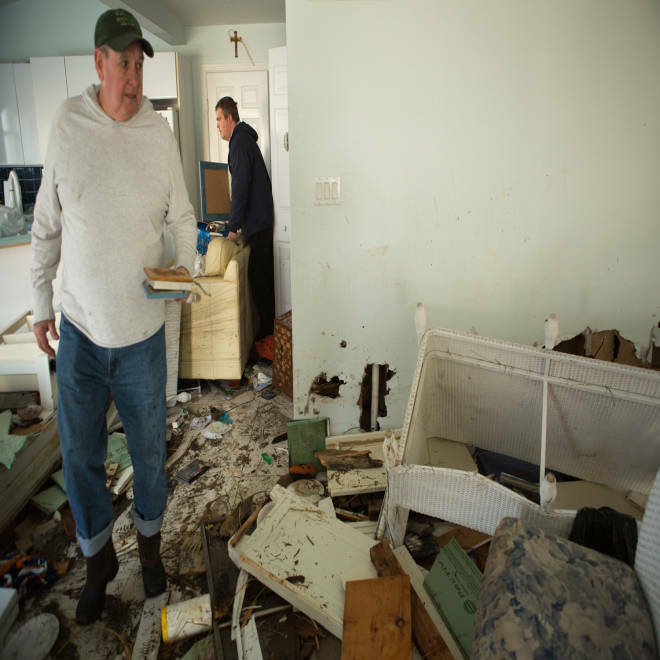 George Donley, left, collects possessions from his flooded home in Breezy Point, N.Y., after Hurricane Sandy. George Donley, 63, walked with his daughter, CiaraGrace Dooley, and her husband through Breezy Point on their first trip back home, towing bags they intended to fill with clothes and keepsakes to take with them to temporary housing. Dooley broke down into tears after she couldn’t reach her home due to the devastation. Donley said another daughter, Julianna Theis, had also experienced flooding in nearby Broad Channel, with 5 feet of water filling her home. “If you can help your kids then you at least feel good, you know. I can’t even help them,” he said. When they reached her father's home, which had been flooded, they found the ground floor in disarray but the upstairs intact. They joked after finding a bottle of “Irish Mist,” a whiskey liquor, but also were shocked to see their furniture and front deck flung across the yards of their neighbors. Donley also started thinking of the good times as he looked out a first-floor window, reminiscing about watching cruise ships pass by. He also chuckled as he recalled climbing on the roof of the destroyed Sugar Bowl bar, just in front of his home, to watch the end of summer party, Breezy Point’s self-styled Mardi Gras. Despite the harsh new landscape confronting them, the family said they would rebuild. “We’ll figure out a way, we will,” CiaraGrace said. “This is what we’re just going to have to deal with. … We have to have a positive mindset so we can get through it. These things are just objects but our family is safe and that’s the most important thing." 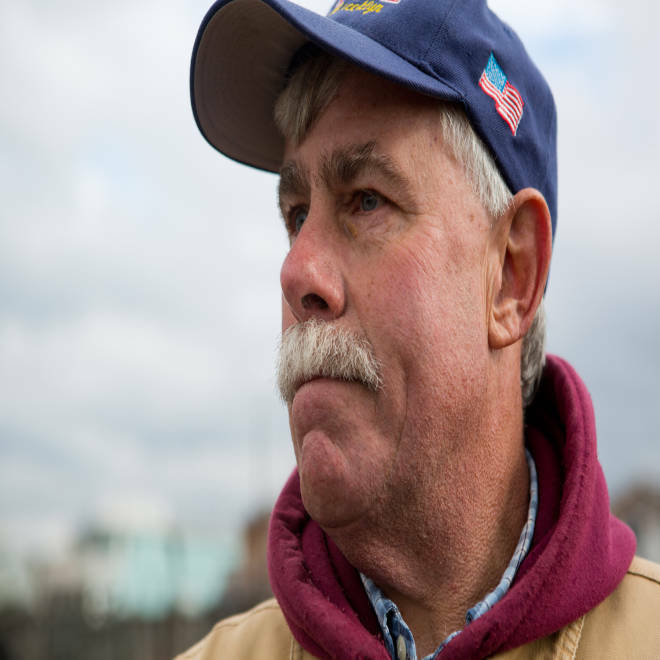 Bob Reilly, 58, hoisted a flag atop a pole on Breezy Point’s promenade, trying to add a semblance of what the community looked like before Sandy. Flags, Fire Chief Ingram said, were typically posted throughout the community in honor of the 9/11 victims. Reilly found a favored stone plaque reading “Royal Irish Constabulary” in the rubble of his home, a summer place that had collapsed after being partially burned, and spoke with a neighbor who also lost his house. The idyllic beachfront town of Breezy Point, N.Y., suffered through 9/11 and a devastating jet crash. But this tight-knit community is determined to carry on despite being ravaged by Superstorm Sandy. NBC's Rehema Ellis reports.